Flyin Hawaiian Zipline raises the bar to new heights with Maui’s longest and highest and fastest zipline course! This thrilling course has eight zipline experiences, and their epic finale is a staggering 3600 feet in length! That’s over two-thirds of a mile ride on one single zipline, and the longest and most exciting ride in Hawaii. It doesn’t end there… the 2800 foot line is tied for the second longest line in the islands, and there are also enormous lines of 2100 feet and 1900 feet. Nearly two miles of parallel zipping action! Kapalua Adventures has over 18,000 feet of zip lines! The Kapalua Zipline tour at the Mountain Outpost features the second-longest zipline course in Hawaii. It has nearly two miles of parallel zipping excitment! Situated on the slopes of the West Maui Mountains high above Kapalua Resort, it boasts a 360′ suspension bridge…the longest and highest in Hawaii. We offer two exhilarating zipline tours to choose from! Kaanapali Zipline - Adventure Awaits! The Kaanapali Zipline is like flying without an airplane! 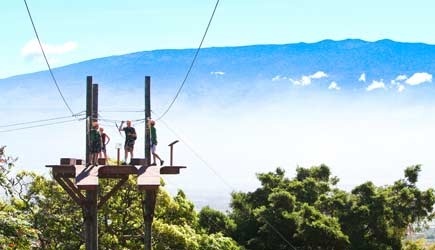 The Kaanapali Zipline tour sits high above above Kaanapali Beach along the slopes of the West Maui Mountains. You will be transported to the foothills Mount Kahalawai where your thrilling journey begins with the exanpansive ocean as your backdrop. There are 3 excellent zipline tours to choose from! Experience the first zipline tour to open in the USA and Maui! Located halfway to the top of a 10,000 foot volcano in a cloud forest. This course includes 5 breathtaking zipline crossings, and an Indiana Jones styled swinging bridge through a towering eucalyptus forest. 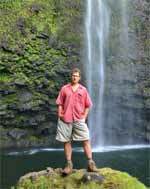 This is an excellent tour to combine with a trip to the Haleakala National Park. Five zip lines and all of them are tandem! Ready for takeoff! Kids only need to be 5 years old and weigh 45 lbs. Soar through swaying palm trees and glide over groves of mango and papaya! Maui Zipline at the Maui Tropical Plantation is a family-friendly tropical adventure, and offers fun and excitement that everyone can enjoy together. There are five side-by-side ziplines ranging from 300 to 900 feet in length. Maui Zipline can accommodate children as young as 5 and who weigh as little as 50 pounds, and observers can watch most of the action at no charge. 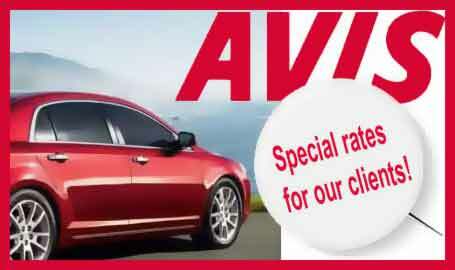 It is the perfect opportunity for a fast-paced and exciting experience with the whole family in a safe and easy environment. Begin your day with an unforgettable Hawaiian volcanic sunrise! After witnessing the beauty and colors of the sunris from the 10,000 ft summit of Haleakala National Park, you will take your adventure to the next level with the 5 line Haleakala zipline just outside the park! Experience 90 foot drops and canyons, soaring through eucalyptus trees, and an Indiana Jones style swinging bridge! Begin your day from the 10,000 ft summit of Haleakala National Park, and after the sunrise begin your bike tour down the 21 switchbacks of the world’s largest resting volcano. Next is the zipline portion of the tour! You will be taken across a swinging bridge, over 90 foot drops and canyons and through a forest of eucalyptus trees. NCL cruise ship passengers in Kahului are able to do either the Flyin’ Hawaiian Zipline or the Maui Zipline with a short 15 minute cab ride from the harbor. They can also do the Kaanapli Zipline or the Haleakala Zipline, but a rental car would be required. Drive time from the harbor to Kaanapali is about an hour, and drive time to Haleakala Zipline is about 45 minutes. Pride of America cruise ship passengers are able to do the Haleakala Sunrise & ZIp and Sunrise Bike & Zip tour on Monday morning, and they will pick you up at the dock. Lahaina cruise ship passengers can do the Kaanapali Zipline with a short cab ride of about 10 minutes. They can also do the other three ziplines but a rental car would be required. Drive time to Flyin’ Hawaiian Zipline and Maui Zipline is about 40 minutes and drive time to Haleakala Zipline is about 90 minutes. Ziplining is fun and addictive, and it is one of the most popular vacation activities in the state of Hawaii. 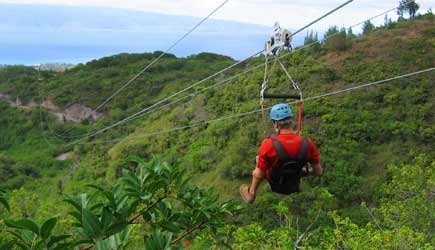 We offer an outstanding selection of Maui Zipline Tours, and we’re sure you’ll have a great time on any of these tours. We have arranged the tours on this page in the order of “level of adventure.” All will give you a positive, memorable zipline experience but some are more thrilling than others. Flyin’ Hawaiian is definitely the most extreme, with the Kapalua Zipline and Kaanapali Zipline tied for second place. Maui Zipline in the third spot on the adventure scale. It has shorter lines than the first two, but each line takes off from a high platform that accentuates the feeling of “height.” And while Haleakala Zipline is fourth on the “adventure” scale, that doesn’t put it in “last place” … if you have never ziplined before and you are bravely trying to overcome your fear of heights this would be the BEST choice for you. We aren’t here to tell you which is the “best” zipline, we want to help you decide which is the BEST zipline for you. While you are having a great time zipping, there are trained guides who are there to make sure that you stay safe at all times. You don’t need to know anything about ropes and harnesses and knots … you just need to be able to follow their simple instructions. The harness and safety lines are carrying your weight at all times while you are zipping; no upper arm strength is required. The most important piece of advice when planning a zipline tour is to pay attention to the fine print … the minimum and maximum weight requirements vary from course to course. All the tours have a minimum weight because too little weight and the person zipping won’t make it all the way to the end of the line, and will roll back to the middle. This is not a safety issue at all, as all the courses deal with this dilemma once or twice every day. They’ve got a retrieval system which is perfectly safe … one of the guides shimmies out on the line with a rope attached to to their harness, and once the “stuck” person is clipped onto the guide, another guide pulls both of them back to the end of the line. If it happens once or twice during a tour everybody laughs and hoots and takes pictures during the “rescue.” But if someone is too light and under the guidelines, they may get stuck on the majority of the lines, and it slows the tour pace down to a crawl as the retrieval process is time-consuming. It can also affect the tours that are following your group. So … minimum weights are there for a reason … to keep the tour flowing smoothly and ensure that everyone has a good time. Exceeding the MAXIMUM weight limit IS a safety issue. It isn’t an issue for the capacity that the line can hold; these lines are engineered to be able to hold up a pack of elephants. The issue is gravity, speed, and the capabilities of the braking system at the end of the line. The heavier someone is, the “hotter” they come in at the end of the ride. If a guest is over the weight limit, their excessive speed could cause them to get a whiplash-like jarring injury when they hit the brakes, or in extreme cases even cause the braking system to … well … break. If the brake breaks, that would be bad for everyone else who is waiting to zip. Minimum and maximum weights are strictly enforced at all zipline locations. As you check in you will at some point stand on a “blind scale” which can only be seen by the staff. If someone falls outside of the weight restrictions at checkin they will be denied participation in the tour … and they will NOT get a refund. I know this sounds harsh, but for safety of the tour, the enjoyment of all participants, and the integrity of the reservation process, they must enforce these guidelines. When you make a reservation you will be asked for the body weight of each participant no matter which zipline tour you take. DO NOT MISREPRESENT the body weights of anyone in your party. If you have someone who is borderline, the best thing to do is to book the tour for the second half of your vacation, and when you first arrive on island swing by the zipline operator for a quick check on their scales. If it turns out someone in your party isn’t going to be able to do the tour, we must know this at least 48 hours before the start of your tour in order to be able to get you a full refund.